The following information was provided by Carol Orr and includes quotes of her mother. Joanne was a graduate of the 2nd class of 1944. She started her own polo team, spent a year as a debutante, sang a role in a Gilbert and Sullivan operetta and ferried bombers, pursuit and cargo planes from factory to airfield during World War II. Joanne Wallace Orr is the daredevil daughter of the wealthy Norman Wallaces, whose chain of department stores - Ford, Ford and Wallace - is prominent on the Eastern seaboard. She was a commercial pilot with a multi-engine unlimited horsepower rating, but she said she is too busy right now to fly. "Every day is so busy in the Governor's Residence that I just get up and check my list. Sometimes before I get that done, people are arriving by the score for meetings, coffees, planning sessions and all the things that need to be done," Mrs. Orr said as she sat in the library. Her Pembroke Welsh Corgi dog, Oliver Perry Morton, stayed close by. The Evansville multimillionaire had been a state senator and lieutenant governor before making the race for chief executive. Living in Indiana in the Governor's Residence was a far cry from her growing up years in Pittsfield, Massachusetts, as the daughter of Norman and Marjorie Robbins Wallace. Her mother's uncle, Morris B. Robbins, was under secretary of the treasury under President Eisenhower. "I was completely overshadowed by my older sister and my brother," Mrs. Orr said. "Marjorie was beautiful and brilliant, and my brother, Lawrence, was very competent." She attended MacDuffie's School for Girls for eight years. "Martha Graham came there to teach ballet, and I loved that," she said. "But best of all I liked to show horses, and I had a polo team - not for competition. My uncle had polo ponies. I was always out in the open with horses, and I didn't know how to relate to people. "When I went to a small school in Great Barrington, Massachusetts, there were just six in each class. I was given a singing role in a Gilbert and Sullivan operetta, and I learned to come out of my shell. When I graduated from high school, I spent a year as a debutante in Boston and New York City. "That's when I met Bob Orr. He was a friend of my brother at Hotchkiss Preparatory School. I learned he was from Indiana, that he was going to Yale - and he made a big impression on me." The Orr family has roots in Ireland. Governor Orr's greatgrandfather, Samuel Orr, was born in Newton-Ardes, County Down, in 1810. He married Martha Lowry there in 1810, and they sailed to America the following year. They landed in Baltimore and then went to Pittsburgh. In 1861 Orr began a business, which continues today as Orr Steel Co., Division of Shelby Steel, Inc., Evansville, Indiana. Orr's mother, Louise Dunkerson Orr, is descended from Thomas Dunkerson, who was born in 1763 in Spotsylvania County, Virginia. He married Lucretia Moore, daughter of Thomas and Phoebe Moore, in 1785. Meanwhile, she studied home economics at Finch Junior College, New York City, where she sewed leather gloves and designed dresses. She attended secretarial school and still loves to type and use shorthand. She worked as a nurse's aid in Springfield, Massachusetts hospitals and had a "crush'' on a stunt pilot. 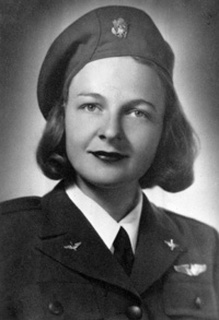 "The war was on, and I heard about the Women's Air Force Service Pilots (WASPs. ),'' she said. "I took off! I went to Avenger Field, Sweetwater, Texas, began the regular Army Air Corps training and became squadron commander. We flew bombers, cargo and pursuit planes all over the U.S. and Canada." She mustered out in December, 1944, to marry Bob Orr. "We were married in the Congregational Church, Longmeadow, Massachusetts, and pipers were engaged to come after the ceremony to play on a special church bell cue. But they missed the cue and came in piping while we were marching down the aisle to the dum-dum-de-dum of the wedding march." They lived at Washington, D.C., where she remembers a colorful life while the bridegroom was in the Quartermaster Corps. "We didn't even see our wedding gifts for two years," Mrs. Orr said. "Mother put them in barrels. "Then Bob began a job hunting tour of the United States. While we were courting, he said we'd never live in Evansville; but he stopped off there for a visit with his parents. He visited the family business, the Orr Iron-Co., a wholesale hardware and steel firm. "He found that the youngest employee was about 60, and the firm had a big inventory of horseshoes and wagon wheels. Bob's business imagination went wild, and he phoned me to ask what I would think of moving to Evansville. I told him, 'Fine.' But I asked him to find a house in the country. I was three months pregnant." While in Evansville, Mrs. Orr organized a chapter of Planned Parenthood, and she piled up countless volunteer hours in Meals on Wheels, the Junior League, Red Cross, historic preservation, the board of the philharmonic and promoting the arts. Mrs. Orr also participated in her children's activities and was once a den mother for a Cub Scout group. "When the children were older, we sent them to boarding schools,'' she said, "so they didn't get a deep involvement with Indiana." Mrs. Orr recalls fabulous parties she and her husband sponsored in Evansville. At a circus party for 2,000 people, they set up food stands, brought in elephants and obtained a merry-go-round and 45 acts. "Another was a black and white party for which we brought in a collection of bird cages and rented tropical birds," she said. "I'll never do that again! But the black and white party surpassed the one Truman Capote had." Orr was elected state senator in 1970 and served as lieutenant governor from January, 1973, to January, 1981. While holding the second highest state office, he also was director of the Department of Commerce and State Planning Services Agency, president of the Senate, commissioner of agriculture and ex-officio member of several state commissions. Mrs. Orr took one look at her husband's office - neon lights and bare walls - and took on a restoration project. She used portraits of Indiana governors found in the Statehouse attic, paintings typical of the Victorian period loaned from the Indianapolis Museum of Art, judges' chairs and a desk and matching console from Indiana National Bank's former quarters at 3 Virginia Avenue. "I made it possible for the bank to put the furniture in the State-house instead of storage," she said. "A fire rail, a feinting couch drafted in Indiana and a pair of Staffordshire dogs for the mantelpiece were among other finds here and there" she said. When Orr defeated John A. Hillenbrand II in the 1980 election for governor, Mrs. Orr tackled other projects. At the official executive residence, she decided to establish a Hoosier-oriented library and arrange for construction of a distinctive gazebo in the spacious yard on Meridian Street. "Pamela Bennett, director of the Indiana Historical Bureau, assisted me in forming a library committee," Mrs. Orr said. " We already have collected a good many volumes by Hoosier authors and are searching for others. They all are catalogued, and we want visitors who browse in the library to be aware of lndiana's rich cultural heritage." The gazebo probably has attracted more attention than any other innovation at the residence. "I don't mind if people laugh when they see the wrought-iron gazebo," she said. "That's why I put it there - to make people happy. "You'd never believe the attention it gets! We change the decorations with each season. There are potted plants throughout the summer, turkeys for Thanksgiving, twinkling lights and evergreens for Christmas - and sometimes we add animals and birds from the zoo. The gazebo was commissioned from Gilpin Ornamental Iron Co. at a cost of about $4,000, all paid for by donations. The first guests to have an official look at the lawn attraction were members of the prestigious Kenmore Association for which Mrs. Orr serves on the board of regents. The association is dedicated to preservation of the Fredericksburg, Virginia, home built in 1782 by Fielding Lewis for his wife, Betty, George Washington's only sister. Since the Orrs moved into the stately Meridian Street home of Indiana's First Family, the entire residence has undergone changes. "I wanted to open it up," Mrs. Orr explained. "I wanted it to be beautiful from the very first glance. The people of Indiana appreciate quality and good taste.'' The First Lady pointed out that no tax dollars have been involved in refurbishing. There have been gifts, bequests and distinctive furnishings, paintings and handcrafted accessories provided by thoughtful people. New York designer Mark Hampton, a Plainfield, Indiana, native, assisted Mrs. Orr in initial planning stages of remodeling the residence. He suggested the colorful chintz fabric on the sofa and love seat in the living room and aided in selection of other fabrics and furnishings. Focal point in the large room is the intricately hand painted Steinway piano which carries a marketing name of Gaeolean. The piano, originally a player, was purchased about 1933 by the J.H. Trimbles for their home at 4343 North Meridian Street, later the Governor's Mansion from 1945 to 1973. William Forsyth's painting, "Day Dreaming," hangs above the fireplace, and "The Village Rider," painted in Nantucket in 1922, is center stage above the sofas. In the dining room the Sheraton cherry table and sideboard set the scene for luncheons and dinners, and a Lalique crystal chandelier adds richness. The breakfast room features tulip tree leaf design in needlepoint on the seats of cane-back chairs. Custom made carpeting to match was acquired several years ago when northern Indiana needlepoint experts completed work on the chair seats. Mrs. Orr chose bright blue and ivory patio furniture for the sun porch from which the visitor can view the expansive southland. Upstairs guest rooms have a Far East theme. Mrs. Orr added a semicircular glass inset above the stained glass window in the north entrance of the Governor's Residence. A nine by nine wall hanging for the foyer, made by Hoosier craftsmen, depicts the five governor's residences. Mrs. Orr has plans for a greenhouse, and she has named a planning committee to stock the wine cellar. Do the Orrs ever get to have dinner alone? "Never!" the First Lady said. "Occasionally on Sunday mornings we sleep late and have breakfast together.'' Mrs. Orr is known for her gourmet cooking, and she wrote a cookbook with Mary Fortune. She said she enjoys the coming and going of people, especially visits of pupils from the indiana schools for the blind and deaf. "We took time to let the blind children feel the lovely things they wanted to see, and the deaf children asked questions and had fun and laughed when signers answered," she said. Vacation? The Orrs go to Lake Wawasee for tennis, and they maintain a home at Vail, Colorado, where they love to ski. During the Orr administration, Fort Wayne flooding forced thousands of families from their homes, a state deficit brought a record tax hike, and the recession upped the jobless rate. Farmers during the summer of 1983 faced great losses in sun-seared corn and soybeans. Federal aid was obtained for Fort Wayne and the farmers. Indiana faced a projected deficit of $452.1 million, and Governor Orr called a special session of the General Assembly, which turned to taxpayers to make the state solvent. Although plant closings and layoffs were major problems, steel and automobile industries called back many employees, as did other plants. Unemployment, still a problem, has decreased. The Governor worked with the private sector, promoted job training, targeted high technology a "must" for Indiana and helped to get investment capital for new enterprises and existing businesses. Longer school terms, emphasis on basic education, mathematics and science, computer programs for schools and higher salaries for teachers are among the many facets of education dealt with in part. Utilities - high gas and electric bills - are a continuing problem. By law the governor named new members to the State Public Service Commission, and with the resignation of the chairman, yet another member.Orr forced abandonment of Public Service Indiana's Marble Hill generating plant at the urging of groups and individuals opposing the plant. Mental health, corrections, roads and highways and need for improved nursing home rules were other concerns, as well as defense of the politicized license branch system which pours large sums into GOP coffers with some, but much less, going to Democrats through personalized plates. In his candidacy for a second term as governor, Orr anticipates a hard fight, but he said he does not expect to be moving out of the office on January 14 when his term expires.